Successfully Added MediaMax - Multimedia Mini Projector (SD Card + USB) to your Shopping Cart. If you are searching for the best value for money mini projector without sacrificing on quality and performance, then the MediaMax Multmedia Mini Projector is exactly what you need! This new Multimedia Mini Projector is our most versatile projector with vibrant color and sharp image qualities, with support for VGA, USB, S-Video and AV input, as well as SD card and USB flash drive connectivity. The MediaMax Multimedia Mini Projector is truly a class of its own with massive 50 ANSI lumen of brightness, which is bright enough for viewing even under normal lighting conditions. Furthermore, it also uses the latest LCOS technology in 800x600 native resolution to deliver astounding, true-to-life images of up to 120 inches from any source. To make life even easier for you, the MediaMax Multimedia Mini Projector has included an integrated SD card and USB thumb drive connectivity, so you don't even need a computer or other source to view your presentation, photos, video, or other media. Simply plug and play! At size of only 13cm x 12cm x 4cm and weight of less than 1 lb, the MediaMax Multimedia Mini Projector can be easily packed into your suitcase or laptop bag. Business people, lectures, demonstrators and anyone who is always on the go will greatly appreciate this ultra-portable, but amazingly powerful mini projector that can be used in any professional environment. So why spend over $1000 on a new large screen TV or $500 more on a "branded" mini projector when the Mediamax Multimedia Mini Projector will meet all your needs at a fraction of what others cost? 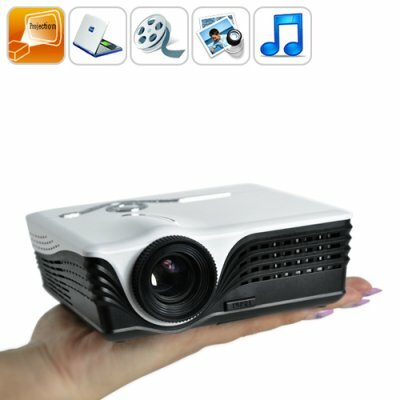 Why wait to enjoy the beauty of this Multimedia Mini Projector, order today and we'll ship it out tomorrow! CHINAVASION HAS NOT FULLY TESTED THE UVTOOLS SOFTWARE AND CANNOT GUARANTEE COMPATIBILITY WITH ALL COMPUTER CONFIGURATIONS. WE DO NOT PROVIDE ANY SUPPORT FOR THE UVTOOLS SOFTWARE. Is the Projector noisy whilst its running? The projections are clearly visible under normal lighting conditions inside any office or meeting room. However, we still recommend low or no light conditions for the best viewing experience. What is UVTool USB Video software? The UVTools USB Video software is a third party USB to video system that allows computer screen images to be displayed by mini projector through the USB Display function and allows the projector to act as a secondary monitor. How do I install and use UVTool? - Your computer should recognize the internal storage of the projector, an extra CD-ROM should appear as well as the portable driver inside "My Computer"
- Re-select the input source as USB display. How do I connect my iPhone/iPod/iPad to the Multimedia Mini Projector?